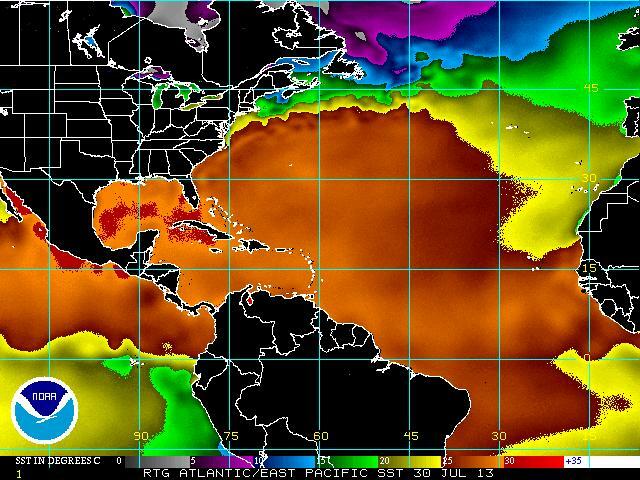 East Pacific 2013 Hurricane Season Off and Running! 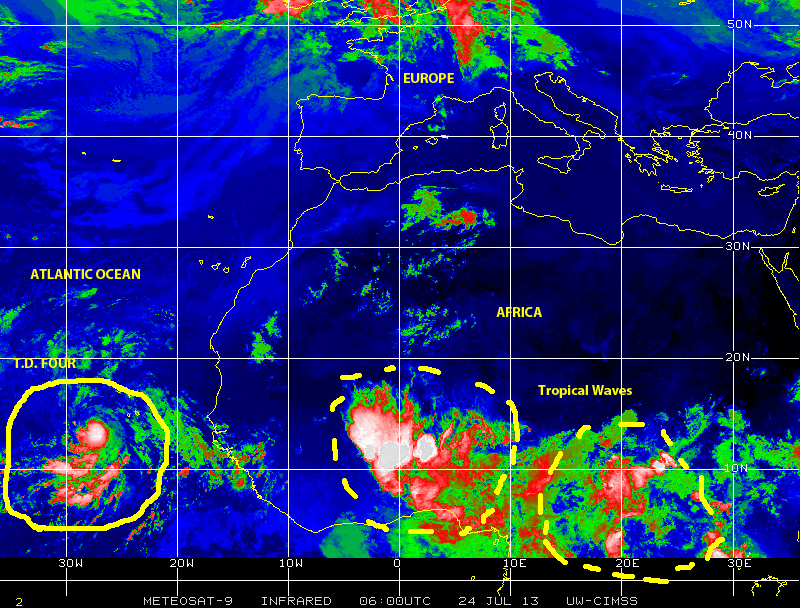 It was July 20, 2013 when yet another tropical wave came off the assembly line that is Equatorial Africa emerging over the warm waters of the eastern Atlantic near the Cape Verde Islands. 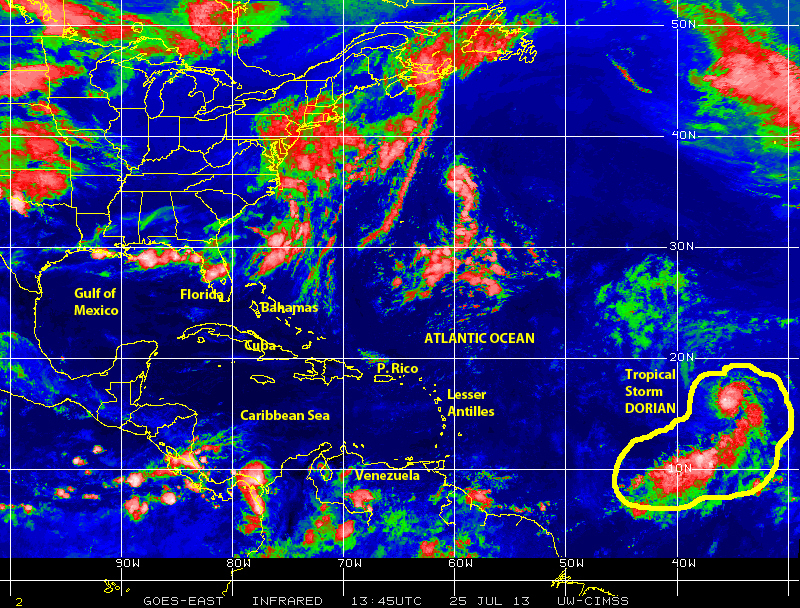 By 23 July this tropical wave was showing a center of low pressure and potential for cyclonic development when it was designated Tropical depression #4 of the 2013 Atlantic Hurricane Season. Over the next few hours TD4 continued moving westward at a fast clip along the northern boundary of Hurricane Alley, getting better organized and stronger until it morphed into Tropical Storm DORIAN, the fourth-named tropical cyclone of the 2013 Atlantic season, on Wednesday 24 July 2013. Tropical Storm DORIAN moved rather quickly along the northern boundary of Hurricane Alley always intensifying and getting better organized until July 27/28 when it began interacting with a hostile ocean-atmospheric environment as it approached the northern Lesser Antilles. The storm encountered a region of cooler surface waters (less than 26 degrees Celsius) and strong wind shear aloft, which caused it to waken and start getting disorganized. As it moved just offshore and to the North of Puerto Rico and Hispaniola generating copious rain over these regions Tropical Storm DORIAN continued to struggle against adverse atmospheric conditions until it basically lost its cyclonic characteristics and began to dissipate. The remnants of TS DORIAN became stronger and better organized, yet again, while coming over the southeastern Bahamas only to fizzle once more. 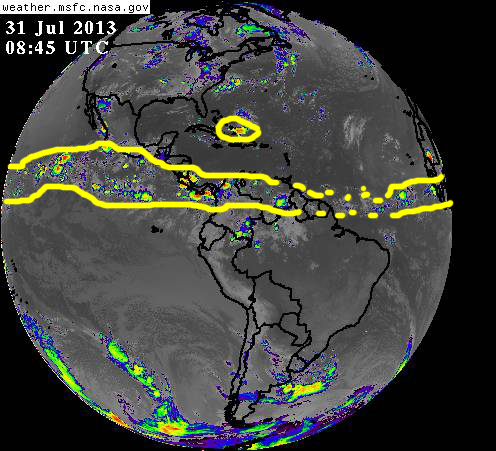 Late on 30 July the National Hurricane Center gave this system 0% probability for cyclonic development. 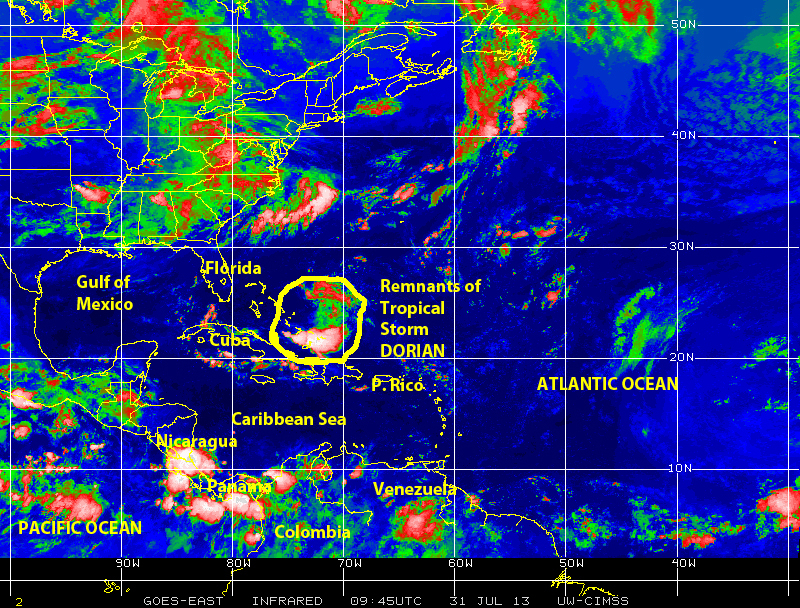 Rhe remnants of Tropical Storm DORIAN are over the Bahamas and approaching the Florida peninsula on 31 July 2013. Today, Wednesday 31 July, the remnants of TS DORIAN are over the Bahamas and may bring rain either to South Florida or to Central/Northern Florida in the next 24-48 hours, depending on how the conjunction of a couple of atmospheric features play out. While the saga of TS DORIAN unfolded over the past ten days the Eastern Pacific has been quite busy generating plenty of disturbed weather from the northern regions of South America to Central America and Mexico, and adjacent East Pacific waters. 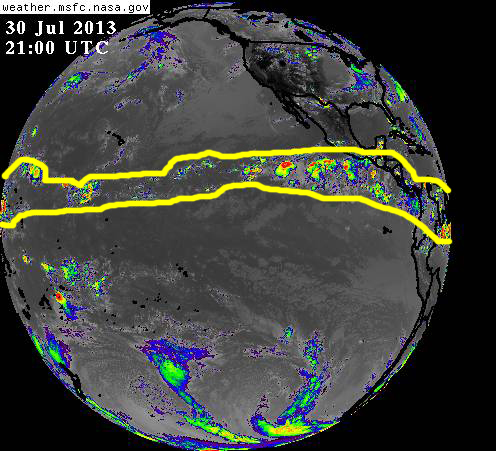 This pattern, which is fed by tropical waves traveling from Africa along the southern boundary of Hurricane Alley until they traverse over the junction between the isthmus of Panama and South America to emerge over the eastern Pacific, has been noticeably strong over the past couple of years making a strong contribution to cyclogenesis in that region. Coincidentally, on 24 July just as TS DORIAN generated over the eastern Atlantic a strong tropical wave began showing cyclonic tendencies over the eastern Pacific near the coastline of Central Mexico. 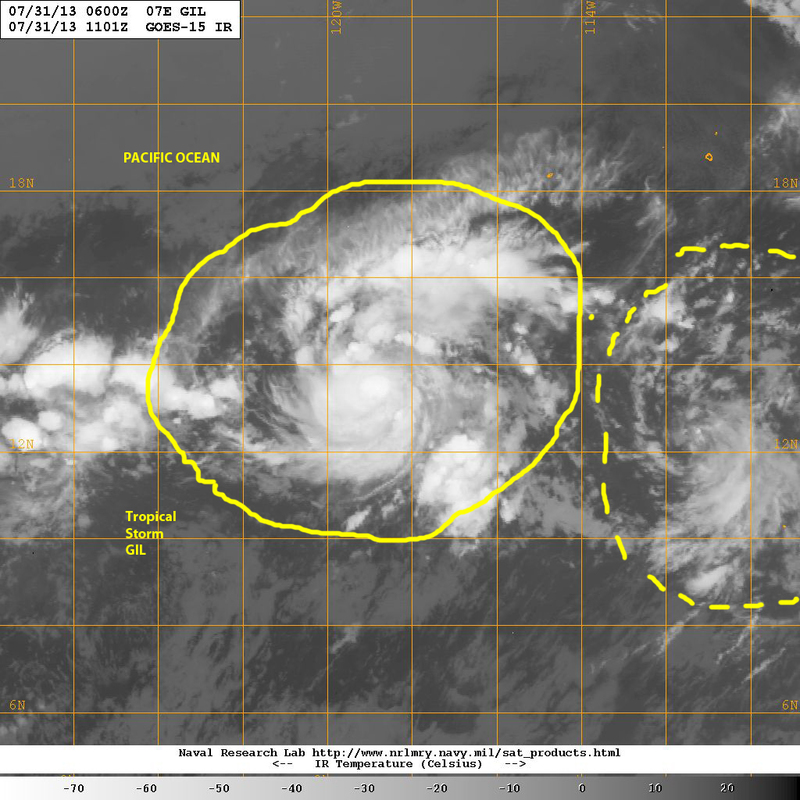 The next day on 25 July that system quickly grew from a tropical depression to Tropical Storm FLOSSIE moving along a WNW track in the general direction of Hawaii. Sure enough TS FLOSSIE started interacting with Hawaii Island, the ‘Big Island’, on 29 July as it tracked just north of the main islands of Maui, Lanai, Malakai, Oahu and Kauai in the long chain that comprise the State of Hawaii generating plenty of rain and high waves, but thankfully little damage. Today, on July the 31st, the remnants of TS FLOSSIE are to the west of Kauai, but back in the same general area that was its genesis over the eastern Pacific there is a new tropical cyclone, Tropical Storm GIL has generated about 1000 kilometers south of the tip of Baja California. 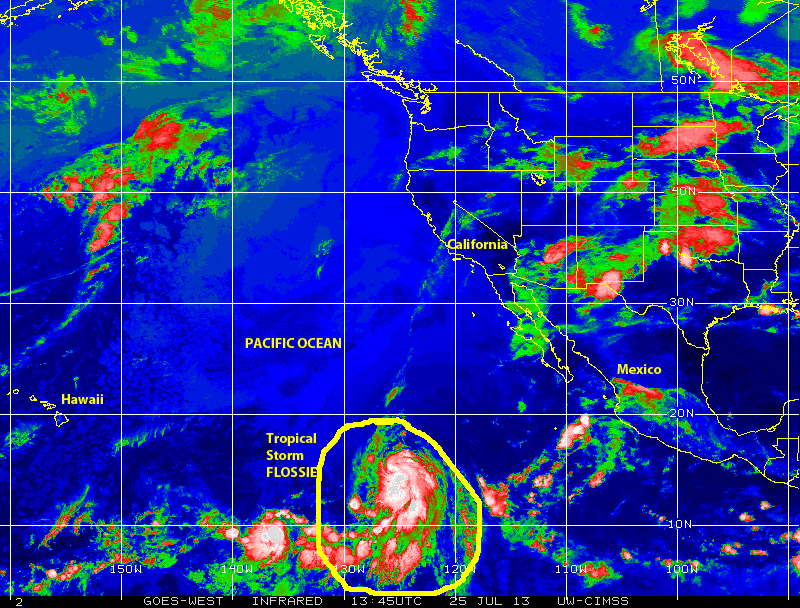 This storm is continuing to strengthen and may reach hurricane strength over the next day or so. Following closely along the same track as TS GIL there is another tropical wave that is already showing a center of low pressure and potential for further development over the next 24-48 hours. Tropical Storm GIL is the seventh-named tropical cyclone that has been generated in the ten weeks since the East Pacific 2013 Hurricane Season officially started on 15 May 2013 and all indications, currently at least, are that there is plenty of fuel for additional cyclonic activity already in the pipeline. We will have to monitor conditions closely in coming months, especially as we enter what historically has been the busiest part of the season in the Atlantic basin from late August to early October. 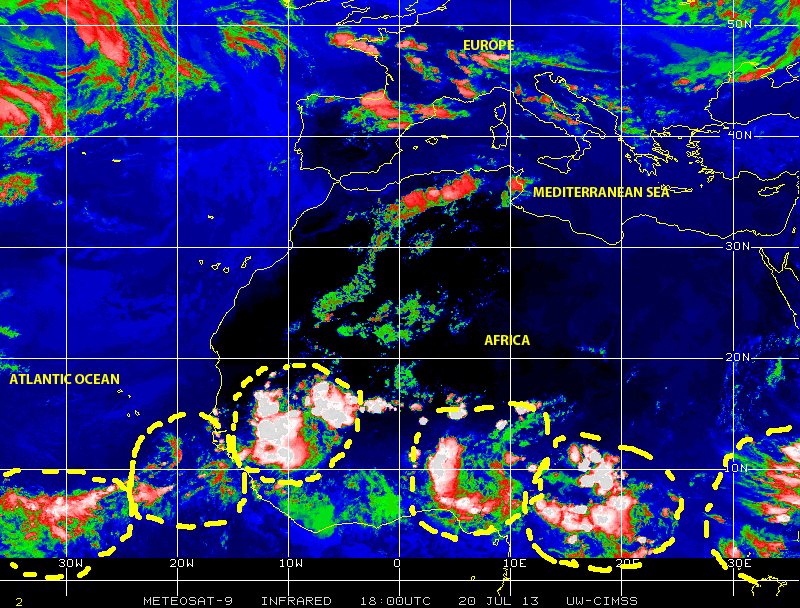 Presently some of the factors that typically contribute to cyclogenesis in the Atlantic and Eastern Pacific basins are firmly in place, as evidenced by the belts of tropical activity seen in the composite full-disk satellite views of Earth, the continuous train of tropical waves along the tropical wave assembly line over Equatorial Africa, and the warming surface waters in the various sub-basins where cyclogenesis takes place. What remains to be seen is when, and if, the traffic of tropical waves and cells of stormy weather that has remained along the southern boundary of Hurricane Alley will begin to shift toward the northern boundary, where it increases the probability of tropical cyclone development affecting the Caribbean, the South Atlantic USA coastal region and, both Florida and the Gulf region. 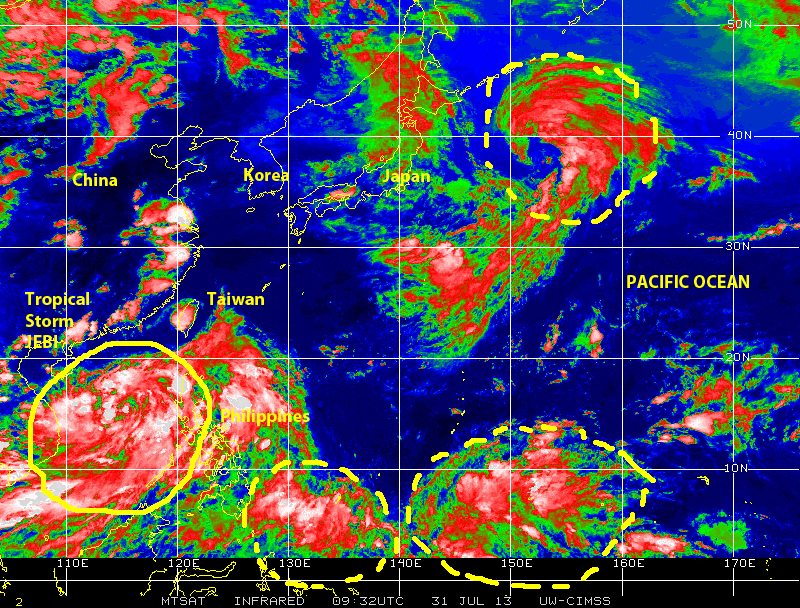 I also call attention to the far region of the Western Pacific, more precisely the South China Sea between the Philippines and China, where Tropical Storm JEBI is generating considerable amounts of rain over the entire sub-basin as it moves in the direction of the Gulf of Tomkin and potential landfall in China or Vietnam. This entire region encompassing the northwestern Pacific, the Philippines Sea, the South China and the Yellow Seas remains one of the wettest and stormiest corners of the world, one where tropical cyclone development is the norm rather than the exception. In closing, let us be reminded that while the total number of tropical cyclones generated worldwide annually has remained more or less constant, there is variability that affects different basins at various times. A good example of such variability is the multi-decadal shifts in annual cyclogenesis that we see in the North Atlantic basin, the latest of which started around 1995 and may continue for another 10+ years. Additionally it is important to note that while debate among scientist regarding the cause and effect between global warming and tropical cyclone formation continues, there is certainty regarding how some of the climatic changes we are experiencing contribute to the creation of conditions that tend to exacerbate the impact of tropical cyclones especially in coastal regions. In this regards residents of vulnerable communities must constantly be reminded that sea level rise driven by global warming is continuously contributing to the exacerbation of storm surge generated by hurricanes. Also, that global warming is contributing to more frequent instances of extreme rain events by allowing the atmosphere to retain considerably larger amounts of moisture, which in turn may result in flash flooding. Most of all, it is critically important to keep in mind is that the impact of a hurricane regardless of its category always carries the potential for causing considerable damage and human suffering. We must therefore always pay attention to the warnings issued by the National Weather Services for our local communities, and those from the National Hurricane Center. We must always be prepared. And we must continuously engage in the practice of MITIGATION to reduce the potential for damage from recurring impacts of hurricanes.